I have always been a fan of the factory scissor jack that comes standard with a Jeep JK Wrangler as it is compact, easy to use, much more practical and safer to use than a Hi-Lift Jack for changing tires and, as if it needs to be mentioned, stores away nicely and out of sight when not in use. Of course, the biggest drawback to the factory scissor jack is that they are only designed to lift a stock height to a mildly lifted Jeep just high enough to allow you to change your tire. Unfortunately, once you get your Jeep sitting on a 3″-4″ lift and on 35″-37″ tires, the factory scissor jack essentially becomes useless. Needless to say, that’s why I bought me an AEV JK Jack Base.Made by American Expedition Vehicles, the AEV JK Jack Base is a molded plastic block that is broad enough to give you a larger foot print and stability in soft sand, has a keyed foot print for your factory scissor jack to prevent slipping and is tall enough to provide an additional 3-1/2″ of lift. And for me, one of the nicest features of the AEV JK Jack Base is that it has been designed with a form fitted shape so that it can be stored snuggly in your Jeep JK Wrangler’s rear floor storage compartment when not in use. The AEV Jack Base for 2007-08 Wrangler provides 3-1/2 inches of added lift height to the stock “scissors” jack – allowing tires of up to 37″ or more to be changed with ease and stability. The large 7.5″ x 10.5″ base gives the jack better stability in off-road and soft soil conditions. Handy compartments in the base store your AEV lug nut extension, and there’s even a slot for the OE wheel lock key. Base is shaped to fit neatly into the rear floor compartment and out of sight. 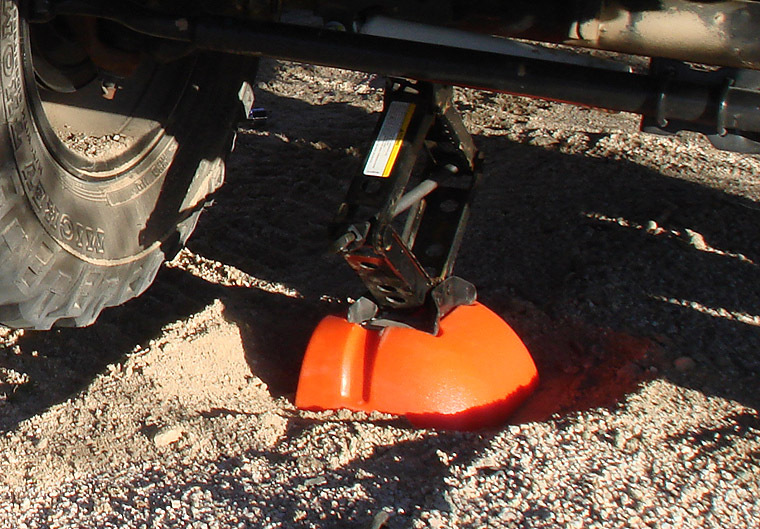 The Jack Base can also double as a wheel chock to prevent a disabled vehicle or trailer from rolling. A must-have for any serious off-road enthusiast. This is what the AEV JK Jack Base looks like. As you can see, the JK Jack Base is quite tall, has a keyed footprint for your factory scissor jack and is much wider at the base which will provide a wider foot print and greater stability in soft sand. As you can see in this pic, the AEV JK Jack base is designed with a form fitted shape that allows it to be snuggly stored away in your Jeep JK Wrangler’s rear floor compartment when not in use. When using the AEV JK Jack Base, the only thing you need to make sure of is that the long flat vertical side is facing the tire being changed and the curved side facing the center of your Jeep. Other than that, it really is a no-brainer to use. Hey! My scissor jack is famous! That jack base worked great, didnt it, Mr Bash? I am glad I stumbled on to this link, I thought that was the Hi Lift base. Well, something else for me to buy. Hopefully it will be awhile before I have to use it.